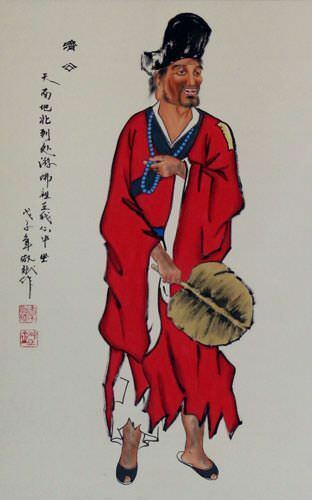 Artwork Panel: 43.8cm x 69cm ≈ 17¼" x 27¼"
Silk/Brocade: 52.8cm x 124.5cm ≈ 20¾" x 49"
Width at Wooden Knobs: 61.8cm ≈ 24¼"
Ji Gong (as he is commonly known) lived during the 12th and 13th centuries. He's seen as the Robin Hood of China, as he always helped the poor. He also broke all of the rules (especially drinking alcohol and eating meat). It is said that as he walked past a temple one day, a statue of the Arhat Mahakasyapa fell to the ground. Thus it was believe the Arhat had descended to the earth in the form of this mischievous monk. With this sign and his infinite generousity, regardless of the rules he broke, or the temples he was kicked out of, he still had the respect of his peers and the masses. 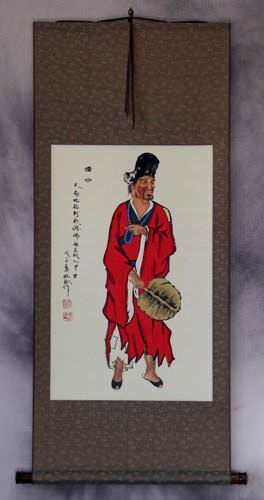 Even Taoists revere this man who was given the title "Living Buddha". There is a temple of tribute to the Mad Monk in the Taishan area of Zhejiang Province. And these days, people who "do their own thing" or "march to the beat of a different drum" see Ji Gong as their personal hero or saint.